When pleasure means everything! When Pleasing God Means Everything! V. 1, (NAS) What is the source of quarrels and conflicts among you? Is not the source your pleasures that wage war in your members? The fleshly person makes pleasure and earthly things the primary passion of life. These things make life happy; the absence of them brings misery; the loss of them, despair. V. 2, You lust and do not have; so you commit murder. And you are envious and cannot obtain; so you fight and quarrel. Do not speak against one another, brethren. He who speaks against a brother, or judges his brother, speaks against the law, and judges the law; but if you judge the law, you are not a doer of the law, but a judge of it. 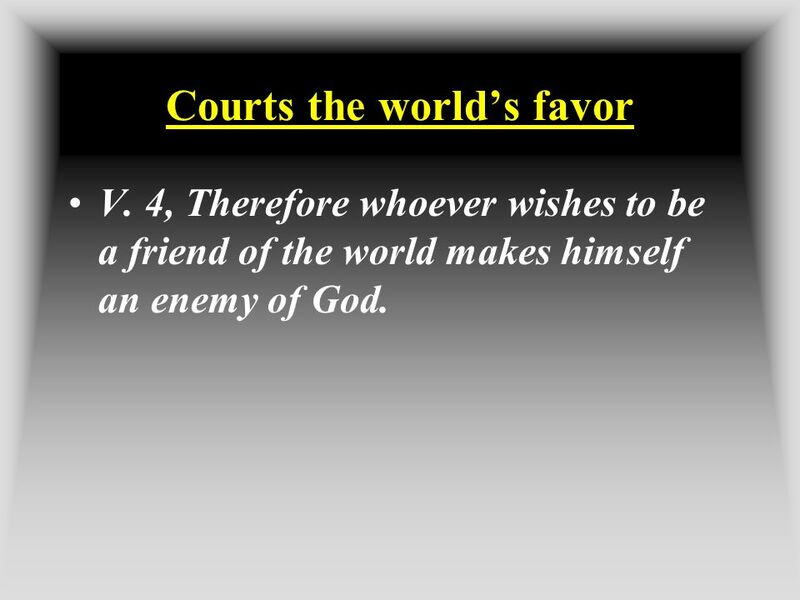 V. 4, Therefore whoever wishes to be a friend of the world makes himself an enemy of God. 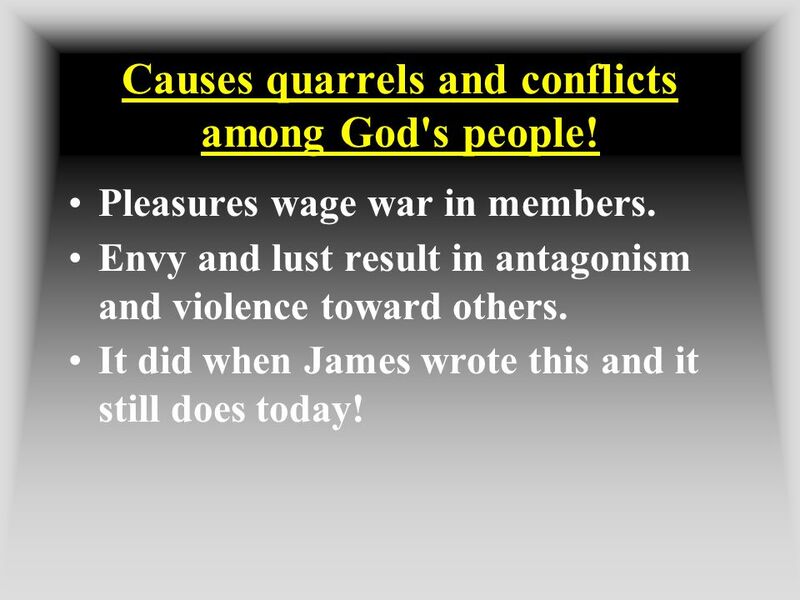 9 Causes quarrels and conflicts among God's people! Pleasures wage war in members. 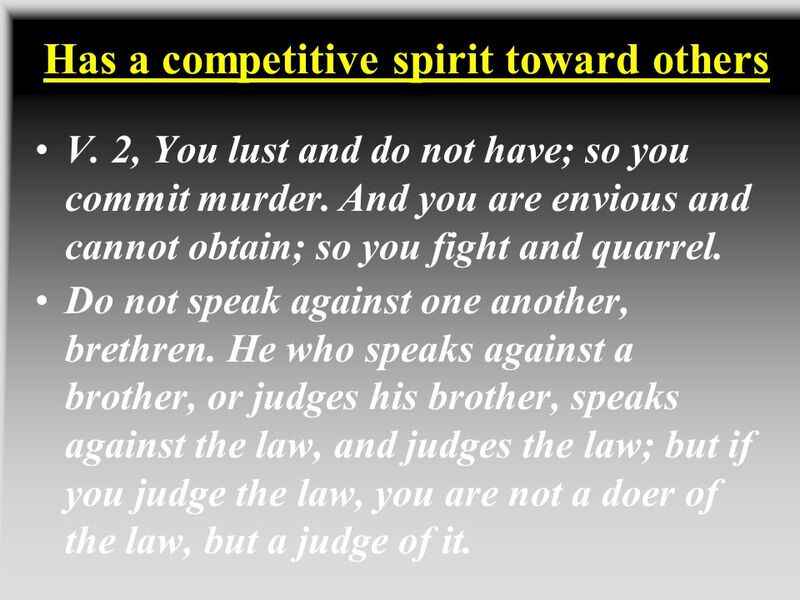 Envy and lust result in antagonism and violence toward others. It did when James wrote this and it still does today! 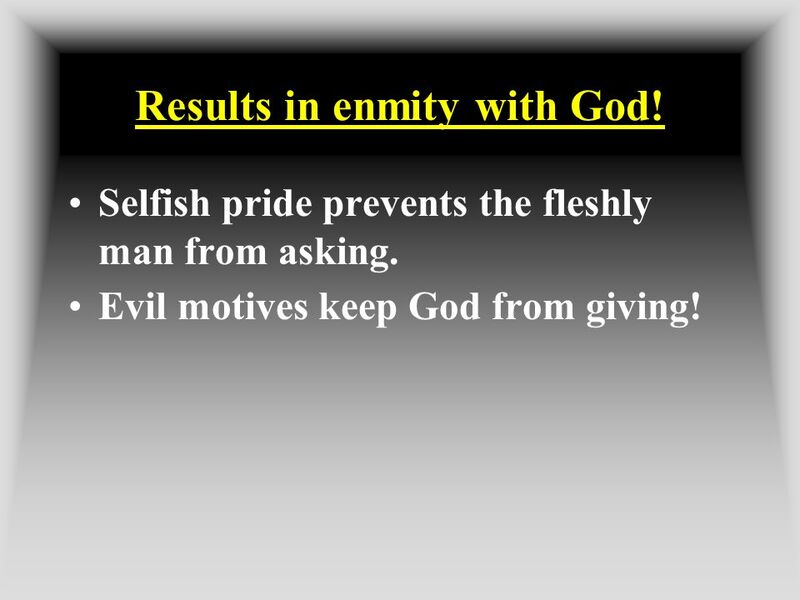 10 Results in enmity with God! Selfish pride prevents the fleshly man from asking. Evil motives keep God from giving! 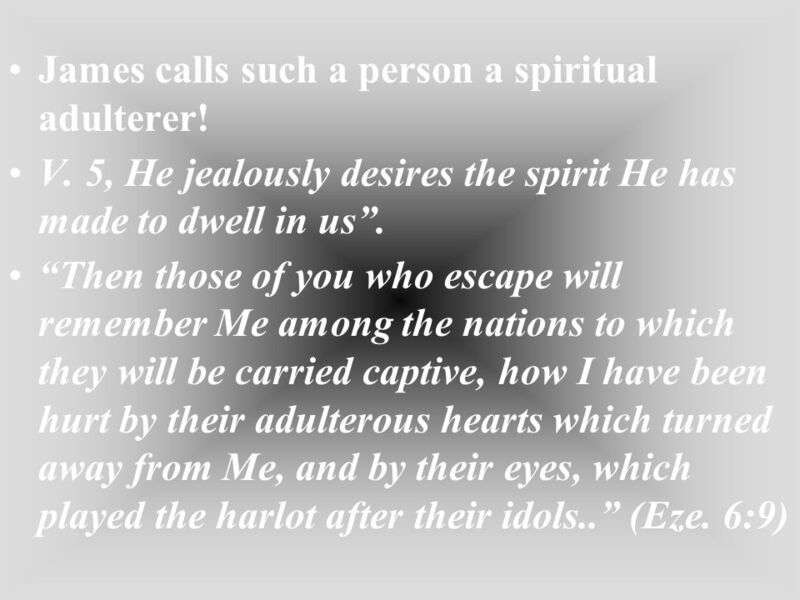 11 James calls such a person a spiritual adulterer! 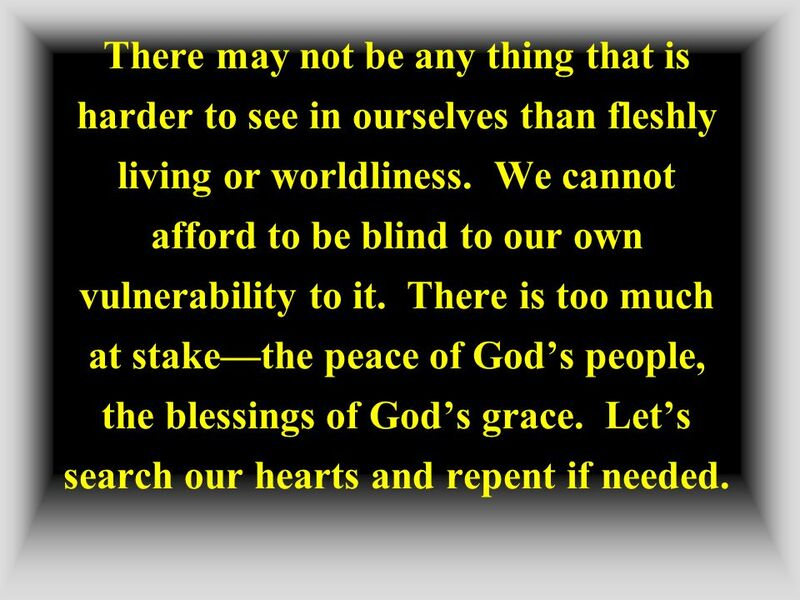 12 There may not be any thing that is harder to see in ourselves than fleshly living or worldliness. We cannot afford to be blind to our own vulnerability to it. There is too much at stake—the peace of God’s people, the blessings of God’s grace. Let’s search our hearts and repent if needed. 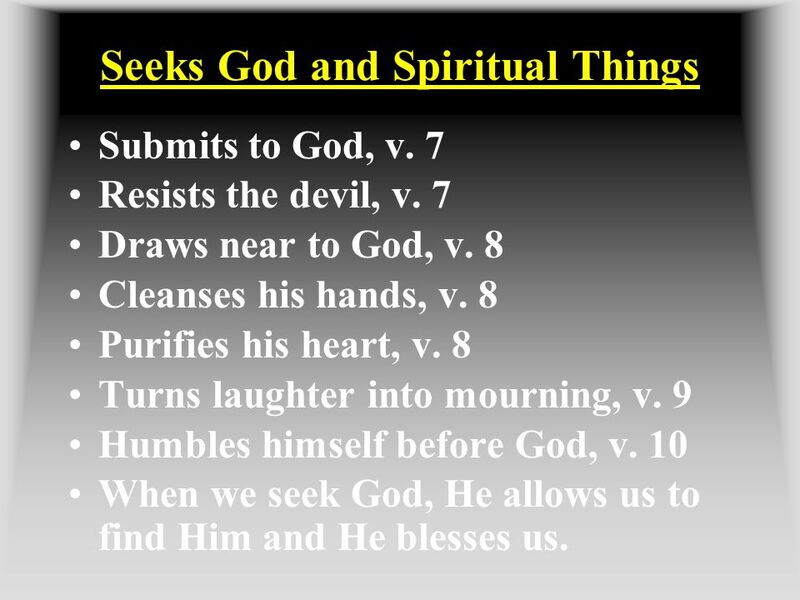 Submits to God, v. 7 Resists the devil, v. 7 Draws near to God, v. 8 Cleanses his hands, v. 8 Purifies his heart, v. 8 Turns laughter into mourning, v. 9 Humbles himself before God, v. 10 When we seek God, He allows us to find Him and He blesses us. He does not want to be a judge of others, but an example of obedience for others. 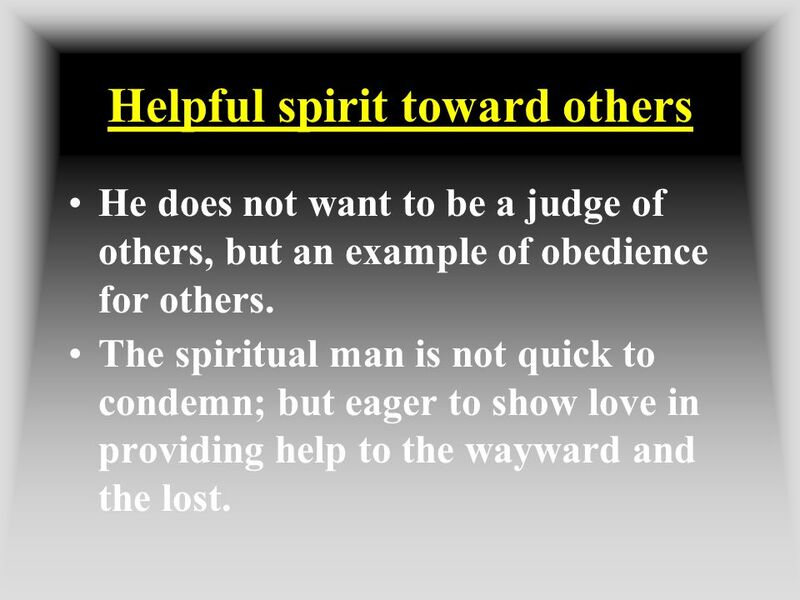 The spiritual man is not quick to condemn; but eager to show love in providing help to the wayward and the lost. 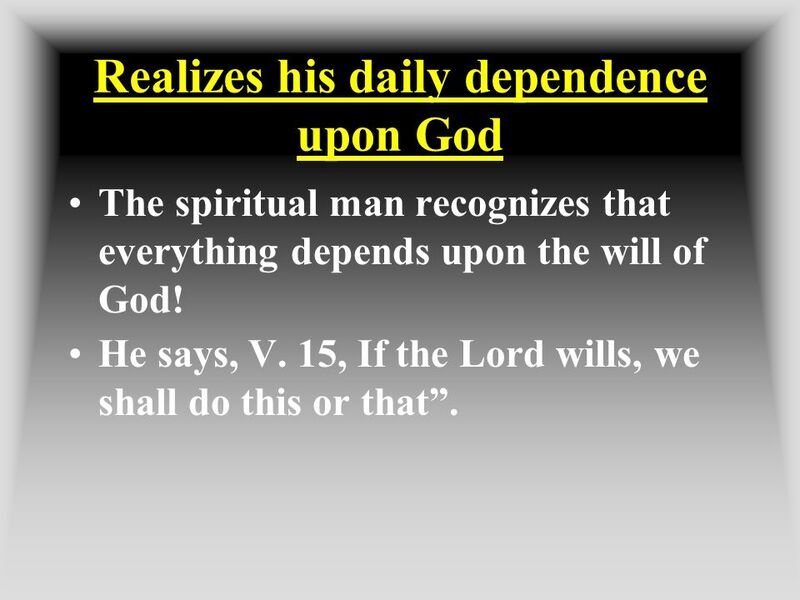 The spiritual man recognizes that everything depends upon the will of God! He says, V. 15, If the Lord wills, we shall do this or that”. 19 Recognizes the need to live by the knowledge he possesses. 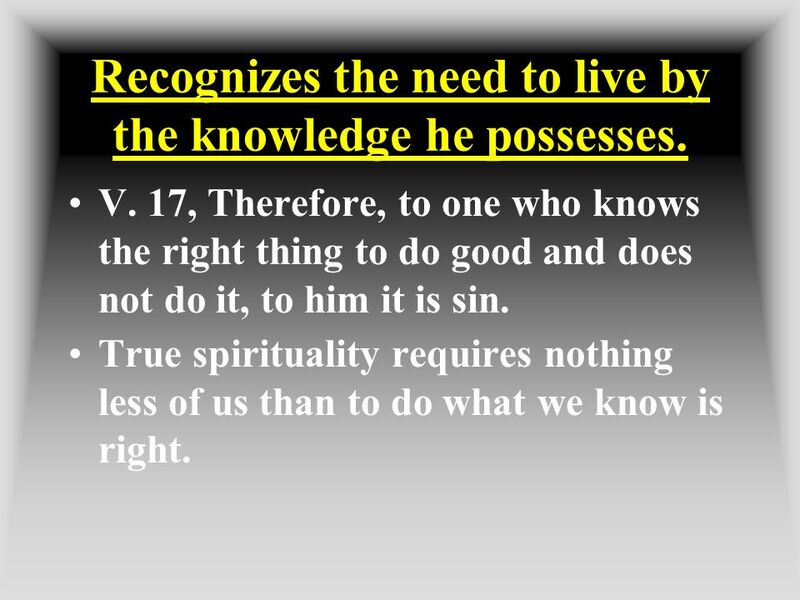 V. 17, Therefore, to one who knows the right thing to do good and does not do it, to him it is sin. True spirituality requires nothing less of us than to do what we know is right. 20 As spiritual people, we ensure the peaceable existence of God’s people together. And, when we seek God, we open up the storehouse of God’s grace and receive of His abundance. 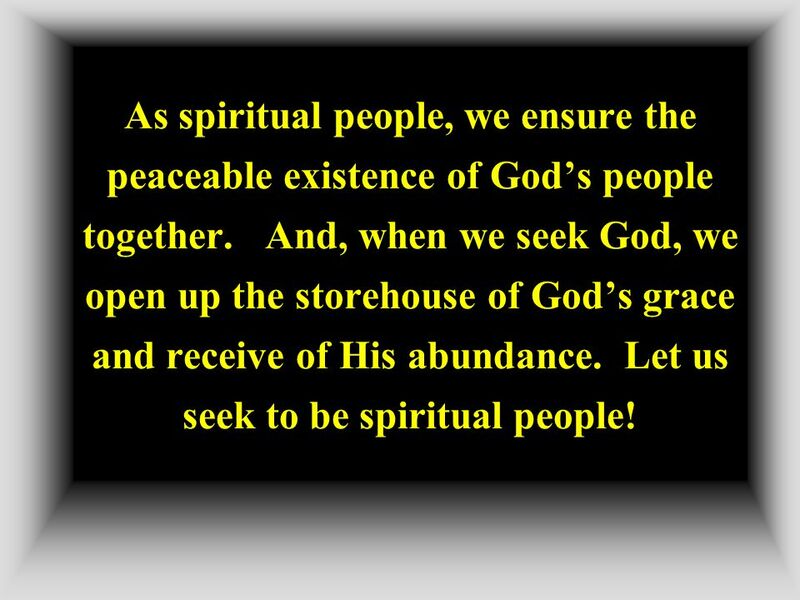 Let us seek to be spiritual people!  Download ppt "Fleshly Man vs. Spiritual Man (James 4)"
Statement When someone doesn’t learn to walk in Grace it is a sign of dysfunction, Grace is God’s Plan, anything else is incorrect. Faith and Submission James 4:1-10 1Where do wars and fights come from among you? Do they not come from your desires for pleasure that war in your members? Self or Spirit. James 4:1 What causes fights and quarrels among you? Dont they come from your desires that battle within you? 2 You desire but do not. Author: James Poitras Global Center for Christian Development Developing Christians Everywhere! If I Were The Devil 1965 What if I was the Devil? 1 Peter 5:8 8 Be sober, be vigilant; because your adversary the devil walks about like a roaring. Isaacs & Ishmaels. The next day John saw Jesus coming toward him and said, “Behold, the Lamb of God, who takes away the sin of the world!” John 1:29 2. Submitting to God “Real Life” [James] Series  James 4:7-10. Drawing Near To God – James 4:5-10.  The Hardest Verse in James  James 4:5 NAS -- Or do you think that the Scripture speaks to no purpose: “He jealously. Extreme Makeover A Hunched Back James 4:1-10. W ARS, W ORLDLINESS AND G OD ’ S W ILL J AMES 4:1-12 W ARS, W ORLDLINESS AND G OD ’ S W ILL J AMES 4:1-12 “ Where do wars and fights come from among you? ConflictConflict Better Known as Fighting and Quarrelling. Inner Struggles James 4:1-12 (James 4) 1 What causes quarrels and what causes fights among you? Is it not this, that your passions are at war within. James 4:1-12. In The Beginning… Everything God created was good and was meant to bring Him glory and honor. Yet, from the beginning, poison came in the. 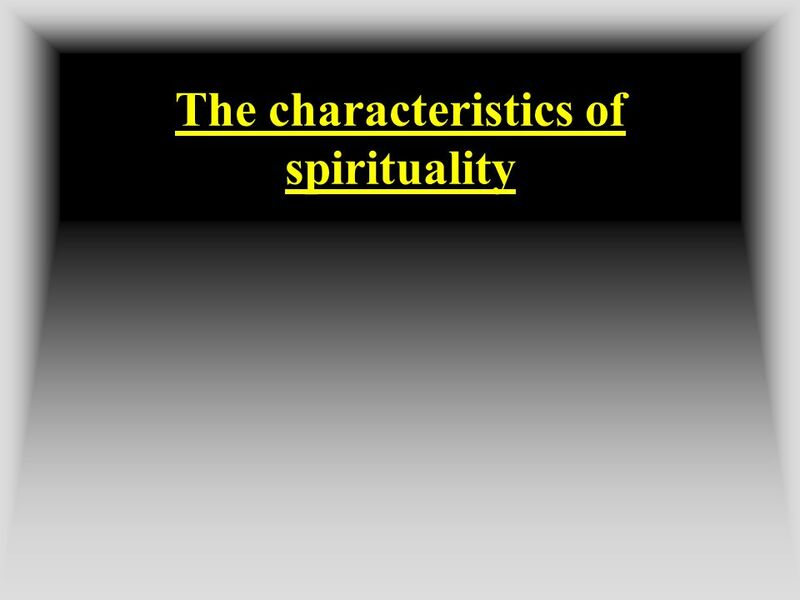 The Way To Spiritual Strength James 4:1-10 What does it take to acquire spiritual strength? A Community of Peace James 4:1-10. A Community of Peace James 4:1-10. 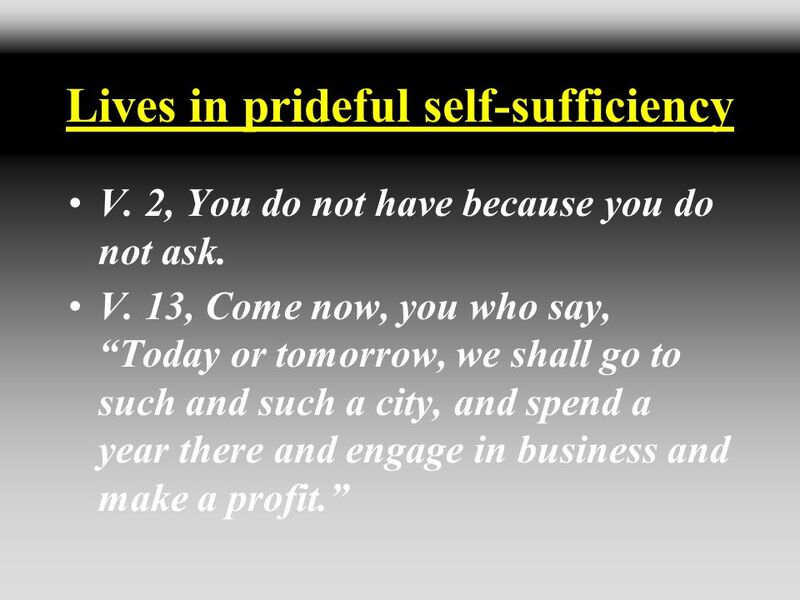 James 4:1-12 “Living out God’s Wisdom Rightly” BY Joshua Bennett 5/6/2012.